But honestly, I'm kind of disturbed by it. You see, the stories that I write here on my little blog, my photos, my life....they are just that. MINE. And I don't appreciate learning that they have been downloaded and then re-uploaded to several different websites under the pretense that I am actually you. In the event that this doesn't make sense to you, please allow me to clarify. My pictures and stories are NOT to be used without my permission. In fact, everything on this website is protected by copyright. 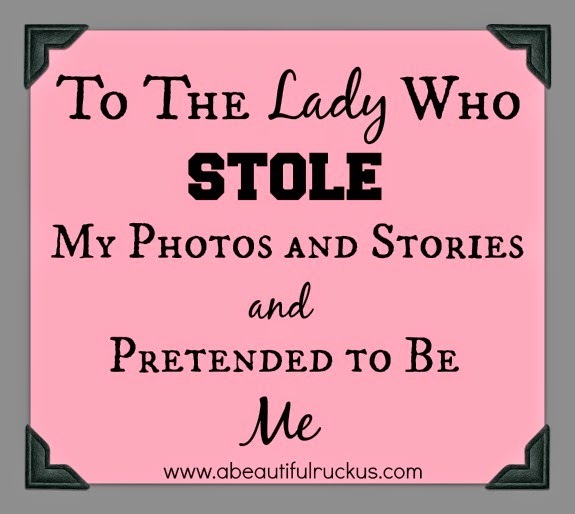 You stole my story and photos, and then when you uploaded them to FaceBook and Baby Center and went around telling people that the woman in the photos was you, you committed identity theft. What you have done is against the law and can be fully prosecuted. Maybe you didn't realize that, but that's a true story. As true as all of the other stories that I write and post on my blog. I don't know if your end goal was attention (actually, I'm pretty sure it was) or money/donations (more than likely), or something else, but you used my stolen pictures to attempt to further lie to and steal from others. Really?? What is wrong with you?! 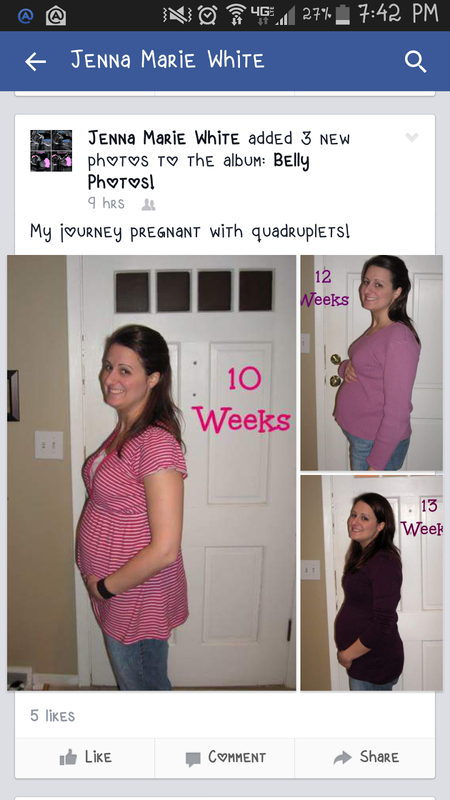 I am curious what you were going to do once you "carried" MY babies far enough in pregnancy. Were you going to suddenly miscarry them? Or were you going to start posting pictures of my babies and calling them your own as well? At the same time that I was trying to get your account taken off of FaceBook, another quad mom gave birth to four beautiful, healthy babies and passed away without ever getting to see or hold them. So your attempt to masquerade as me and gain the goodwill of people doubly hurts right now. We have a very real quad family that just lost their wife and mother that need real HELP, and you are out trying to make a name for yourself and see what you can get out of it. I feel that I should clue you in on something. You should know that I am in an awesome network of quads (and more) moms. We reach clear around the world and are in every state in the US. We are tight, and we know each other's kids well. I also have a wonderful community of readers here on A Beautiful Ruckus who know my kids well. In fact, it was a reader who realized that you were masquerading as me in one of her FaceBook groups, and it took my quad mom friends about 30 seconds to find your profile once they realized what was going on. This sort of identify theft has happened before to moms in our group, and believe me when I say that the group has become experts on finding the perpetrators. You do not want to mess with me or the other mamas. I promise. We will find you. Every time. Jenna Marie White. Or is it Jenna Corcoran? Or is it something else entirely different at this point? Whatever your real name is....you are sick. Really ill. Please go see a mental health professional. Whatever is making you rationalize behavior like this is not okay. Do you even understand the severity of what you've done? This isn't a game. This is a criminal act. Talking to a doctor is very appropriate at this point. I want you to get better, but you have to take the first step to get help. Preferably before you steal from someone who will press charges. Now is a good time to turn your life around. Mostly though, I just feel pity for you. Pity that you think your life is so boring that you would take mine and make it yours. Life is what you make it. I didn't ask for quadruplets, but I've chosen to embrace life and all of the ups and downs that go with it. My life is no more important or special than your life. Maybe you are hurting because you want a baby yourself, and you can't have one. Jenna, I've been there. I get it. I know the tears and the pain and the frustration. But you can choose to make the most of what you have and bless others rather than stealing from them. The best advice that I can give you is to go figure out how to live your life and enjoy what God gave to YOU. Find the beauty in it. I promise it is there if you look. DO NOT STEAL MY PHOTOS OR STORIES AGAIN. And that goes for every other quad mom, triplet mom, twin mom, singleton mom, or other human being on earth who has photos and stories that you have been eyeing. This is your warning. Please take it and move on. I'm coming in as "anonymous" because I don't have an account in the list. I'm Trish Boyko from Victoria, British Columbia, Canada. I read a lot of multiples blog and it astounds me how many times this has happened. Do these women think they won't get caught? Are they living in some fantasy world and are seeking attention or are they looking for 'donations'? So many blogs I used to follow have no gone private just for this reason. I hope you put an end to her before she moves in on your children's pictures and claims them as her own. It's one thing to go after an adult, it's quite another to go after children. Thank God there's a strong network in place to call B.S. on the fools who do this sort of thing. Wouldn't it be fabulous if you could get a hold of a real pic of her and put it on your site? The internet is not as anonymous as some people think it is. Good luck in ending this and hopefully this woman will get the help she needs...before the police knock on her door. WOW!!! Thats a very strange thing for someone to do! Im sorry this is happening to you! Perhaps you should consider pressing charges if this continues. The mere thought of a cyber stalker scares the heck out of me. I had my identity stolen a few years ago. Im still dealing with it. It has ruined my credit! The worst part is, is that the fool went and used my ss number and address to get food stamps! The food stamp office KNOWS who did that to me but because of confidentiality laws, they will not tell me who the person is! My lawyer is still working on it. I told him when they find who did this, I want that person to spend some time behind bars! Its sad..... I hate a person whom I do not yet know! But I will know one day! And he/she will pay dearly! While this is truly terrible, you have handled it like a champ! Stay strong and continue to count your blessings! I am so sorry this has happened to you! I've been an admin in a group over on CM, and sadly anytime anyone comes in with a story of multiples, we have to watch them carefully, because almost every single time it has been a fake identity. We've gotten pretty good at researching pictures uploaded to find the real person. It's sad and frustrating, because like you said, there are REAL mom's and families out there that need help. I do wonder how many people are out there doing this, or if it is just one very ill person who needs some serious help! I had a similar experience with my blog and pictures of my triplets. Creeped me out so much I made my blog private and quit blogging. It's such a shame people do this and ruin the fun! I'm just... speechless. Wow. What is wrong with some people??? Oh my goodness that is crazy! Why would someone do that? I enjoy reading about you and your kids so much. My niece and nephew (preemie twins) are about their same age so it's fun to see you going through the same milestones. outside, having four kids all at once does seem kinda fun, but I know it's way more work than you put out there! I can't believe someone would actually want to steal your life! If you need a lawyer to help you with this, my husband is willing to help. Send me an email or FB pm and I'll get you two in touch.